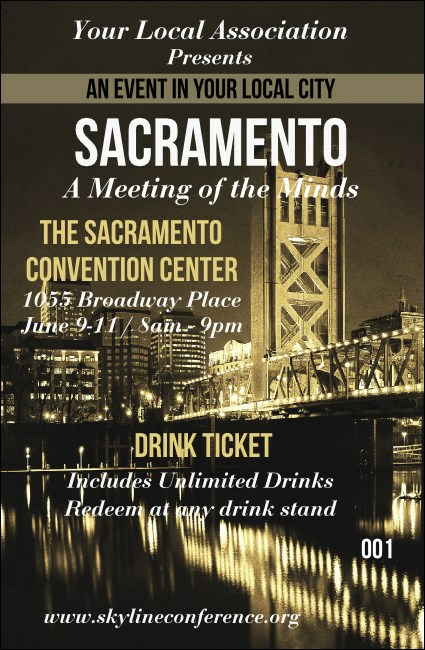 Raise a glass to the California Capital with the Sacramento Drink Ticket. Featuring the beautiful lights of the city skyline, with the impressive Tower Bridge in the forefront, the ticket also features individual numbering for convenience. Whether you celebrate Cal Expo's Grape and Gourmet, Beer Week, and Cocktail Week, guests will appreciate the Sacramento Drink Ticket. Create memorable California events with TicketPrinting.com!